Doncaster Knights have signed Junior Bulumakau from Glasgow Warriors. The 26-year-old - brother of current Knights star Andy - is a serving soldier with The Royal Scots Borderers, 1st Battalion The Royal Regiment of Scotland. 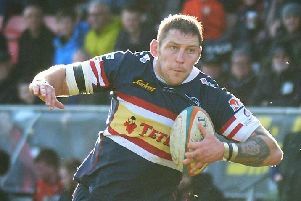 He repeated the feat in last month’s Babcock Trophy game, scooping man of the match and touching down twice in the Army’s 29-20 victory. “I’m very much looking forward to joining Doncaster Knights alongside my brother next season, I haven’t played with Andy since we were in school which is very exciting,” said the Fijian-born utility back. “I’ve only heard good things about the set-up, team and coaches which is easily seen from the on field success, reaching the play-off final and semi-final in the last two seasons. “I hope to contribute to further success. “He also provides us with more versatility across the back line. “Junior’s style is similar to Andy’s in that he is very creative going forward. “If anyone saw his recent man of the match display in the Army/Navy game it just typified how he can play and his ability as a finisher.